(HOST) When the Food Crisis began in 2008, families began to spend more of their income on groceries. Many people wondered how it would impact the people of Vermont. Commentator Ron Krupp tells us of the hardships and the positive efforts being made in the Green Mountains to combat the Food Crisis. (KRUPP) There’s a lot of stress at the dinner table these days. The high cost of food is especially hard on those with limited incomes. 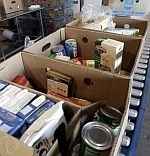 The long lines of the Great Depression have been replaced by food shelves and pantries. The middle class is also tightening its belt. It’s estimated that 38 percent of the Vermont population in 2008 often had to choose between putting food on the table or heating their homes. Children eligible for free lunches in our schools stuff food in their pockets on Friday to get them through the weekend. On summer breaks and during vacations, thousands of low-income children don’t have access to free or low-cost meals the way they do when schools are in session. In Vermont, there aren’t many affordable summer programs for children from low-income homes. Poor families can’t afford to pay for camps or child care while they work. In 2006, there were 252 summer food programs that served fewer than 1 in 5 low-income children in state. The numbers have increased somewhat since then – but not nearly enough. Still, many positive steps are being taken in Vermont when it comes to dealing with food shortages. The Intervale’s Healthy City program in Burlington salvages surplus vegetables for distribution to the Chittenden County Food Shelf. The gleaning project of Salvation Farms in Central Vermont and the Northeast Kingdom distributed over 161,000 pounds of gleaned and donated produce to the Vermont Fookbank in 2008. The food was harvested and distributed by 200 volunteers, who worked with 30 farms and food producers. Willing Hands in the Upper Connecticut River Valley acquired fresh fruit and vegetables from local farms, farmers’ markets, co-ops and supermarkets and delivered three tons of fresh produce to food shelves each week. FoodWorks in Montpelier has partnered with the Vermont Foodbank in Barre to provide food to the needy, as well as providing community garden programs in low-income neighborhoods, so people can grow their own food. The Northeast Organic Farmers Association of Vermont has a farm-share program with CSA farms for low-income people. The program subsidizes 25 percent of the cost of the share. The Vermont Campaign to End Childhood Hunger plays a major role in raising the consciousness of local citizens to the plight of the hungry, as well as empowering low-income people and educating them about good food shopping habits and how to prepare food in the home. Of course, if people received a fair wage in return for work, we wouldn’t need as many food shelves and pantries in the first place. That’s a goal as important as providing nutritious meals and groceries to those in need. But that’s another – tougher – challenge.